The fourth of July brings BBQ, camping, family outings, and fireworks. While we might look forward to the lights and sounds of the fireworks, they terrify many pets. Noise phobia, the fear of loud noises, is a common ailment for pets. Whether it be a gunshot, thunder, or fireworks, the sharp and loud sounds can result in a significant fear in our pets. This overwhelming fear can be seen in physical symptoms and behaviors that may cause harm to our pets or damage to property. Pets who suffer from this malady may exhibit symptoms that include excessive drooling, hiding or escaping, shaking or trembling, loss of appetite, diarrhea, inappropriate urination or defecation, and vocalization (barking howling, whining). Escape and hiding behaviors often result in broken windows, doors, fences, and gates. Dogs may chew their crates. The end result is serious injuries including lacerations, damage to footpads, and injuries to the teeth and mouth. More pets go missing July fourth than any other day of the year. Pets who are not afraid of cacophony of sounds and lights generated by fireworks my attempt to sniff, taste, chase or bite the curious anomalies that light up, make noise, and dance around. These behaviors can result in severe burns or poisoning. 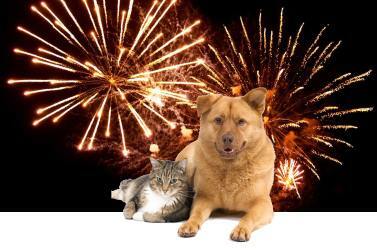 The chemicals in fireworks are very hazardous to our pets and us. Consumption of these chemicals can result in bloody diarrhea, kidney or liver failure. What Can We Do For Our Pets? Establishing an environment that minimizes the effects of the loud noises and flashes of light will help reduce the impact. To accomplish this keep your pet inside. Close windows and blinds to reduce noise, lights, and smells. Turn on lights in the home to minimize the visual effect of outside flashing lights. Turn on a radio or TV to a normal volume to help dampen the noise. Act normally, for example speak in a normal tone and volume. Create a safe space to escape. Establish a den like space in which your pet can take shelter. This may be a simple as using a crate for your dog. Before the day arrives, help your pet discover this space and give them a chance to become comfortable with the space. Give your pet a distraction. Common distractions for dogs include treat toys from which a good deal of effort and concentration is required to extract the treat. A gentle pressure, much like a hug, will often help calm anxieties in pets. There are products that will provide this constant gentle pressure. Examples of these products include Anxiety Wrap and Thundershirts. Exercise your pet and make sure they have time to relieve themselves before the main activity begins. Make sure your pet has an update identification tag or microchip, just in case they get loose. As a last resort there are medications that can be used to sedate your pet. Always consult a veterinarian before medicating your pet. For more information or assistance a mobile veterinary service can provide an in home evaluation and recommendations for your pet. Rolling Vet in Salem, Oregon provides compassionate and expert behavior consultations, physicals, diagnostics, and medications for your pet. You can contact Rolling Vet via our ‘Contact Us’ page, on the phone at (503) 400-7992, or on the web at www.RollingVet.com.